Levi D. Smith is a 2002 Georgia Tech graduate with a bachelor of science degree in computer science. He completed his master of science degree in industrial engineering at the University of Tennessee, Knoxville in 2008. As a hobby, he creates computer games for competitions. He has games published on XBox One, the Microsoft Store, Itch.io, and Google Play. 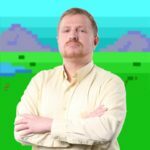 He hosts the monthly Knoxville Game Design meeting with other game developers in the East Tennessee area.